Gail Orenstein, has been a photographer for 23 years. She lives in London and is a member of The NUJ and The International Press Association. She is also a news Drone journalist. Gail was the first female to drone in Kurdistan, Iraq during the Mosul offensive in Iraq 2017. She has travelled often on her own to 84 countries and started her journey documenting prisoners in Guatemala in 1982. She has photographed and droned in many conflict zones often the only female photographer in the field at the time. She was a Press photographer for The Chicago Immigration and Naturalisation office. Her recent work has focused on her drone journalism work in conflict zones. Her drone footage and photography work has been distributed world wide including CBS news, Der Stern, Aljazeera, Rudaw, The Guardian, The Chicago Tribune, The Times, Slate, Mashable, Washington Post, TIME, The BBC, The Telegraph, Kurdish TV24, Microsoft and many more. Andy Allcooc is founder of BirdDog Drones, Inc.,; he is also a former Florida law enforcement officer, investigator and instructor and is the Florida state UAV Program Director for Civil Air Patrol/USAF Aux. Andy also is a FAA Commercial Helicopter and Airplane pilot, Squadron Commander of 58 adult member unit of USAFAux/Civil Air Patrol, FL-076, Search and Rescue pilot, Orientation flight pilot, an FAA licensed drone services provider, consultant, and Part 107 instructor, located in Miami Beach, Florida. Barry Moore is a UAS (drone) Pilot for the Mansfield Police Department in Texas. Barry has been a Police Officer with the City of Mansfield for 24 years and has recently retired with 31 years of police service. Barry is still assisting MPD with their drone program and is a member of the Public Safety UAS response team. Barry started his Police career as a patrolman and worked in the patrol division for 3 years. Barry joined the SWAT team while in patrol and remained on SWAT for 8 years. Barry worked undercover in the west sector of Ft. Worth for two years with the Narcotics Task Force and then transferred to Criminal Investigations where he worked for 18 years as a major case Detective. For the Last 4 years, Barry has started the first Police UAS Program for the city of Mansfield and was the first full time UAS unit in the state of Texas. Barry has helped with the development of the Public Safety UAS Response Team (PSURT) which now has over 25 cities participating. Barry graduated from the Texas A&M police academy and currently holds a Master Peace Officer License with the state of Texas. Barry has advanced certifications in Homicide Investigations and Sexual Assault investigations. Barry is currently working with All Mobile Video (AMV) with live streaming. Barry is working with the North Central Texas Council of Government (COG) to form a statewide standardized training program for emergency services. Barry Moore currently resides in Cleburne Texas. Bart Massey, Executive Director of the USA Drone Port is a Licensed Remote Pilot with the FAA. The nation’s first non-profit drone facility used to train, invent, innovate, develop and manufacture unmanned robotics. The USA Drone Port is the catalyst for entrepreneurs, educators, students and innovators growth. In the fall of 2017, he led the first team to have a live UAS integration into Search and Rescue in the state of Kentucky. This event included three helicopters, seven UAS Pilots, five fire and rescue departments, land-based rescue vehicles and many spectators and facilitators. The USA Drone Port has collaborated with the State of Kentucky in a proposal of partnership for the Integrated Pilot Airspace issued by President Trump. Bart is excited about the future of southeastern Kentucky. Pilot Program to accelerate the safe integration of drones in into the national airspace. Chris Stiles is President of Unmanned Services Inc., which currently serves over 200 customers to include government and academic institutions, and has 5 licensed pilots that have conducted 2,843 commercial flights totaling 1,108 hours since 2015. USI was also one of the first entities granted a night flight waiver. Mr. Stiles started his career in Army Military Intelligence flying drones 15 years ago and subsequently has attained experience on over two dozen Military and Commercial UAS systems varying in size from 0.5 – 3,000 lbs., all while operating a variety of specialized payloads and sensors, performing as an instructor pilot, and has conducted 8,000+ hours operating Beyond Visual Line of Sight, as well as experience conducting Combat SAR operations in Iraq and Afghanistan. He has also authored a multitude of technical publications and books, been a member of standards committees, regularly consults for a multitude of US government agencies, and occasionally speaks at conferences. Recently Chris has been busy with his company contracting drone services for coverage of the PGA tournament and several NBA training sessions. Rick Lusk is the owner of Oculus Deus, LLC, a Service-Disabled Veteran-Owned Small Business (SDVOSB) that provides strategic guidance and assistance for commercial and governmental Unmanned System use. He is the Founder and former Director of the UAS Research Center at Oak Ridge National Laboratory. His first implementation of unmanned aircraft was while serving as a Marine Corps intelligence officer during the Gulf War in 1991. Lusk is a member of the DHS Critical Infrastructure Partnership Council (CIPAC) Unmanned Aircraft Systems Working Group and is a globally recognized expert in utilizing UAS technologies for examining and producing data for critical infrastructure. He is an advisory board member for the USA Drone Port. His 2017 publication, “An Early Survey of Best Practices for the Use of Small Unmanned Aerial Systems by the Electric Utility Industry,” is considered the authoratitive manual for electric utilities to start and conduct safe UAS operations. Lusk is currently writing a UAS operations manual for public safety and emergency response. Joey Stidham, CEO of Stidham Reconstruction and Investigation, has over 20 years of Law Enforcement experience, a retired KSP trooper and private investigator. As a Kentucky State Trooper he worked over 400 traffic collisions and was on the scene assisting of countless others, giving him invaluable experience in the real world of accident investigation. Trained as a traffic collision reconstructionist, he has the knowledge and experience to determine why and how accidents occur. Over the past 20 years Mr. Stidham has advanced his training to the highest levels in the field and the has acquired the technology for SRI to make them one of the most advance companies in the nation in their knowledge and capabilities. Mr. Stidham and have been on the forefront of utilizing drone technologies for forensics purposes. They now use drones to create 3-D forensic maps and models of crime scenes, traffic collision scenes, and vehicles. This saves them valuable man hours and can be done from the safety of the shoulder of the roadway. The accuracy of these models is 1 millimeter. Randy Nichols is Professor of Practice of Unmanned Aircraft Systems (UAS) – Cybersecurity at Kansas State University Polytechnic (KSUP) in Salina, Kansas. Nichols serves as Director of graduate UAS - Cybersecurity programs at KSUP. Nichols is internationally respected, with 50 years of experience in leadership roles in cryptography, counter-intelligence, information security (INFOSEC,) and sensitive computer applications. Throughout his career, Nichols has published seven best-selling textbooks included his 2018 work: Unmanned Aircraft Systems (UAS) in Cyber Domain: Protecting USA’s Advanced Air Assets. Nichols has provided counsel to the United States government and is certified as a federal subject matter expert (SME) in both cryptography and computer forensics. Mr. Richard G. Lescalleet is the Vice President of Sales and Marketing at AirShip Technologies Group, Inc., responsible for developing the strategic direction, sales focus, and sales growth in addition to all marketing aspects of AirShipTG. Mr. Lescalleet has over 30 years’ experience in the field of telecommunications and data communications serving in both technical and administrative capacities. His previous positions have included VP Sales & Management for an International Systems Integrator, Director of Program Management for an international optical DWDM manufacturer, Program Manager of a Data Communications NASA contract, and Supervising Engineering on a SCADA communications contract, Product Marketing Manager for both analog and digital products, Business Development Director for an international product as well as his current position. Mr. Lescalleet has also actively participated and supervised the engineering efforts in the design of a communication network for a gas SCADA network consisting of over 200 remote locations. His managerial background includes both sales and marketing responsibilities while his technical background includes installation, testing, maintenance and operation on point-to-point, point-to-multipoint, and troposcatter microwave, echo cancellers, transcoders, smart multiplexers, SONET Multiplexors, and DWDM fiber optic products. He has worked in many international locations and lived for many years in the Middle East. Mr. Lescalleet has a BS in Business Management and an MBA in Telecommunications Management. Mr. Lescalleet is married and lives in VA.
C. J. Childers is the Deputy Emergency Management Director for Pike County, KY. C. J. has held this position for 23 years. He has through the years been the go to person for technology for the Pike County EM Office. He has numerous responsibilities from programming radios to working to repair and maintain the vast communications system for Pike County Emergency Responders and Sheriff’s office. He has been working with and flying remote controlled drones for 5 years and currently maintain the drone fleet of 5 drones with varying capabilities. He is a licensed drone pilot. He has experience flying SAR Missions as well as flying the scene of fatal auto crashes, Law Enforcement assistance of various types, hazardous materials, and many types of damage assessments flights from slides to flooded homes and business to damaged roads and other infrastructure. Tim Goeders, of Tyler, Texas, is the President & CEO of 'Hybrid Air Transport', Inc (HAT) and the Manager of the 'Applied Global Aquatic, Terrestrial & Atmospheric' (AGATA), Institute. HAT was formed to develop large-scale Cargo & ISR Airship 'Manufacturing & Maintenance-Retrofit-Overhaul' (MMRO) hangar infrastructure and the related flight services ecosystem. AGATA was formed to collaborate across many industrial and administrative discipline sectors to develop and apply solutions to complex problems burdening 'Humanitarian Assistance / Disaster Relief' (HA/DR) agencies and numerous other industrial sectors with logistics challenges. Tim has over 25 years of experience creating large-scale 'Public Private Partnerships' (3P's) from Concept-to-Completion that leverage public and private capital assets for economic development, collaborative innovation and for the societal & environmental resilience of the U.S. - and its' global partners. Leonard Toler has 19 years of experience with the fire department, he is the Fire Chief at Avawam Volunteer Fire Department in Perry County, and serves as Captain at the Hazard City Fire Department. Leonard is a certified Hazard Materials Technician, Kentucky Certified Fire Instructor , Certified Fire Fighter level 1 & 2, Kentucky Certified and National Registry Certified Emergency Medical Technician, Certified in Search and Rescue. He serves as the Fire Chief in command for the USA Drone Port during Search and Rescue training events. Paul Campbell is an officer and a UAS Pilot for the Hazard City Police Department. Campbell, along with Williams, has conducted aerial photography utilizing a UAS for accident reconstruction as well as search and rescue operations during reports of high-risk missing persons. Utilizing drones and mapping software allows Paul to to investigate accidents without wasting time or resources deploying manned helicopters. Once an aerial scan is complete, investigators can review the data from their office, reducing the time needed to stop traffic, which in turn creates a safer experience for drivers and officers. Chad Perry has been flying fixed wing drones for 12 years and has competed in Multi-GP drone races for the past 3 years. Chad has designed and built numerous remote control airplanes, some as large as 6 foot wingspan and demonstrated those in airshows across the nation.Chad is proficient in 3D printing and designing often using 3D printers to print his own designs and equipment mounts. Donna Farler Roark is the Chief Information Officer at Hazard Community & Technical College overseeing all facets of technology and is over the Technology Solutions department. Donna was instrumental with the organization of the Search and Rescue Pilot training, Emergency Responders training and command post setup project. Donna serves as research chair for the USA Drone Port and serves on the USA Drone Port Board of Directors. Dr. Ella J. Strong is the Dean of Distance Learning at Hazard Community and Technical College and has been Dean since 2011. Dr. Strong received her Doctorate of Education (in Educational Policy Studies and Evaluation) in 2011 from the University of Kentucky. 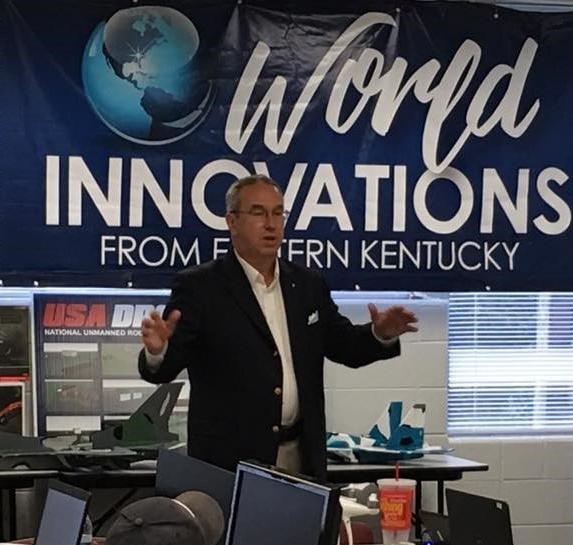 Dr. Strong was crucial in the development of the Unmanned Systems Technology curriculum at HCTC and serves on the USA Drone Port Research Team. Charles Hoskins works at Hazard Community & Technical College with Technology Solutions as the Information Technology Project Manager. Charles has hands on experience with the technical integration of the UAS digital feeds and command post setup. Charles serves as the Command Post Technician in charge during Search and Rescue training with the USA Drone Port. Brandon Munsen works at Hazard Community & Technical College with Technology Solutions as an Information Technology Specialist. Brandon has hands on experience with the technical integration of the UAS digital feeds and command post setup. Brandon serves as a Command Post Technician in charge during Search and Rescue training with the USA Drone Port.